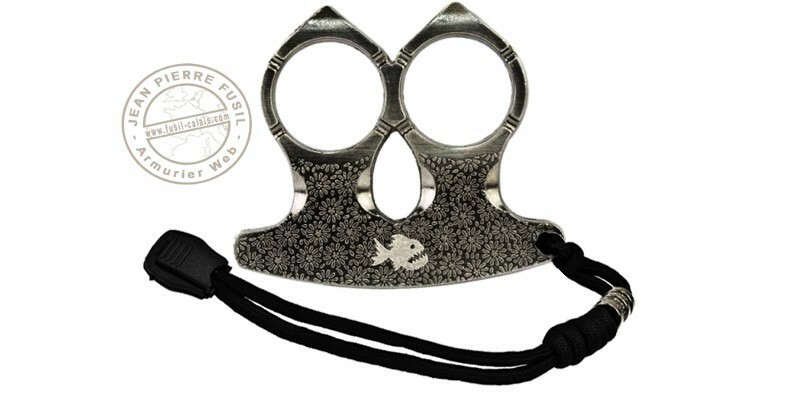 Great titanium finish with floral patterns, for this 2 fingers knuckle-duster with peaks. Discreet, it remains a formidable self-defense tool. Metal knuckle duster representing 2 conjoined water drops, pointed. It has a grey titanium finish, wtih small flowers pattern engraved. It has a hole on the basis, to hang the paracord wrist strap deliverd with. Discret, pratique, bien fini, le cordon en trop! Solo para usar en caso necesario.